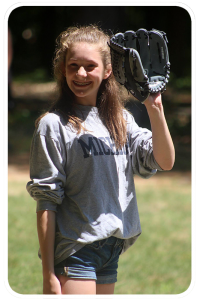 Because of Camp I… have developed and improved my social skills. Before attending camp, I was very shy and hesitant to approach new people to make new friends. During my first year of camp, my cabin counselors did their best to make the campers comfortable and encourage us to interact with each other. By the end of the two week session, I made a bunch of friends that I kept in contact with throughout the year. The following summer, I looked forward to seeing and spending time with my friends, and found it a lot easier to make new friends. I really enjoy these friendships and love sharing a cabin with my old friends (and sharing camp traditions). I am going onto my third year at Camp Q and can’t wait to see my old friends, make new friends, and sing the Camp song as we pull into the Camp driveway.